The 201-unit Paradise Creek combines smart growth design, sustainable features and on-site supportive services to transform resident lives and the historic Westside neighborhood. 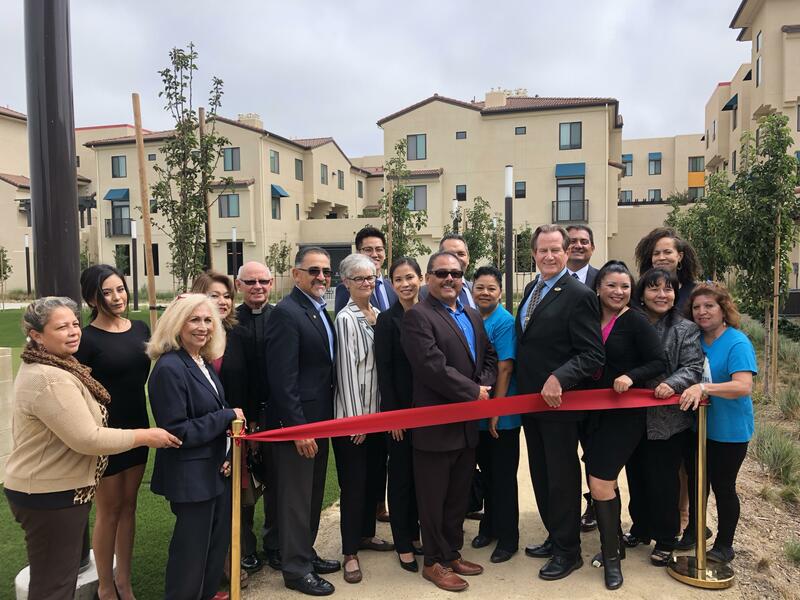 National City, CA (September 20, 2018) – Elected officials, National City residents and business leaders celebrated the opening of the second phase of Paradise Creek, an affordable apartment community developed by Related California and Community HousingWorks (CHW) at a ceremony on September 20 in National City. Senator Ben Hueso, Assemblywoman Lorena Gonzalez-Fletcher, Mayor Ron Morrison, Vice Mayor Albert Mendivil and Councilmembers Mona Rios, Alejandra Sotelo-Solis and Jerry Cano were on hand with CHW leadership to commemorate the completion of the new homes. 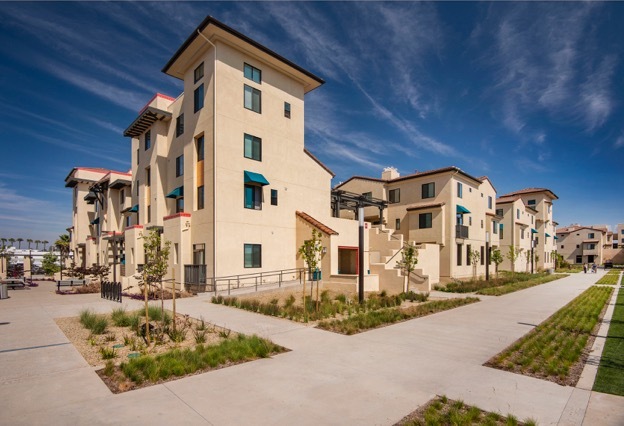 “Paradise Creek is a new benchmark for development in National City and the San Diego region,” says Sue Reynolds, president and CEO of Community HousingWorks. “Community HousingWorks is nationally recognized for our leadership in sustainability, both in terms of construction materials, energy and water, and also in our programs that provide residents the tools to have financial stability and forge stronger futures. Paradise Creek is a public-private partnership between National City and co-developers Related California and Community HousingWorks. The community includes 201 affordable apartment homes in a transit-oriented design with LEED-certified sustainability features. Paradise Creek is the first community in San Diego County to receive funding from California’s Affordable Housing and Sustainable Communities program, an effort that supports greenhouse gas reduction. The program uses “cap and trade” funds to incentivize biking, transit ridership and remediation of contamination. The community was awarded $9.2 million for Phase 2 because of its focus on sustainable living and redevelopment of the site. Senator Ben Hueso, National City Mayor Ron Morrison, Councilmembers Alejandra Sotelo-Solis, Jerry Cano, Mona Rios and Albert Mendivil, CHW CEO Sue Reynolds and other dignitaries participate in the ribbon cutting for Paradise Creek Phase 2. Envisioned as an incubator for homeownership, Paradise Creek supports residents with Community HousingWorks’ award winning programs to improve their financial well-being and achieve life-changing goals. These opportunities include financial coaching, classes, and the Rental Home Stability Program, Community HousingWorks’ landmark eviction prevention program that helps residents at-risk for eviction achieve financial stability and sustainability. Other Community HousingWorks programs include the Study Stars K-5th grade after-school literacy program and the Diabetes Prevention Program with Scripps Health. Paradise Creek is managed by Related Management Company and was designed by Pyatok Architects and Spurlock Landscape Architects. Phase 1 of Paradise Creek opened in 2016 with 109 homes. The second phase completes the community with 92 more homes priced for families making 30% to 50% of the area’s median income. Paradise Creek’s annual resident income limits are $15,330-$20,460 for a studio, $16,410-$21,900 for a 1 bedroom, $19,710-$26,280 for a 2 bedroom, and $22,770-$30,360 for a 3 bedroom. The Paradise Creek community is certified as LEED for Homes because of its environmentally-conscious features. The community’s design includes an emphasis on green living. The site is located on National City’s historic Westside and situated to promote walking, biking and transit ridership. The Paradise Creek master plan enhances the community’s natural character with new homes, sidewalks, bike lanes and a 3.9-acre public park scheduled for completion in 2019. Because of its environmentally-focused design, Paradise Creek has been recognized with a Silver Catalyst Award from the California Sustainable Communities Partnership. Upon completion of the adjacent park, the community master plan will be certified LEED – Neighborhood Development, a designation focusing on master plan areas that revitalize neighborhoods. The Paradise Creek community is located on city-owned property that was remediated from a public works yard. Leadership from the Environmental Health Coalition (EHC) and San Diego Organizing Project (SDOP) first initiated the vision for a pedestrian-oriented, sustainable and affordable community on the site in 2005. These grassroots groups and the city collaborated to develop the Westside Specific Plan, a master development that would serve as an incubator for home ownership and revitalization of the historic neighborhood. The city selected Related California and Community HousingWorks as co-developers of the community in 2008. Paradise Creek is located at 2120 Hoover Avenue, National City, CA 91950. Click here for more information on Paradise Creek.